A treat and activity filled pail all the little Somebunnies on your list will love. 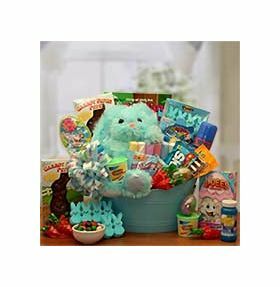 Filled with traditional Easter sweets and fun filled activities this pastel Easter pail is sure to be a big hit this year. 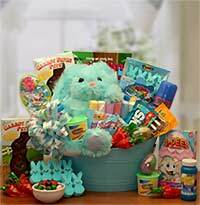 Includes: Blue gift pail, Milk chocolate bunny, Easter toy with jelly beans, bubbles, 50 page coloring book, Fun Dough, Sidewalk Chalk, Robins egg malted candies, 2 mini carrot shaped bags of Jelly beans, Silly Putty, Fruit Flavored Skittles, Peanut M & M's candies, Silly String, 3-D Gummies candies, Easter Loli pop with popping candies, marshmallow Peeps, 8" plush bunny.Gift measures 13" wide, 9" deep and 15" tall and weighs 4 pounds completed.